Trio Goya was formed by Maggie in 2001 in response to her particular love of the Classical trio repertoire and a desire to explore this with equally devoted players. She is joined by Kati Debretzeni, violin and Sebastian Comberti, cello. Their recording of Haydn trios on Chandos Records has consistently elicited the highest critical acclaim. 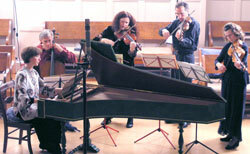 Trio Goya has been heard most recently in their January 2014 sell-out Wigmore concert. They will be at Kings Place in October joined by viola player James Boyd, in a programme to include Mozart and Beethoven piano quartets. Born in Transilvania, Kati Debretzeni immigrated to Israel at the age of 15. She finished her studies at the Tel Aviv Academy of Music under Ora Shiran, and studied the Baroque violin with Catherine Mackintosh and Walter Reiter in London. Since living in the UK, Kati has played with most of Britain's leading period instrument orchestras and ensembles. In the year 2000 she was one of the leaders of the English Baroque Soloists throughout Sir John Eliot Gardiner's Bach Cantata Pilgrimage. As violinist and leader of Florilegium she performs regularly throughout Europe, the USA and South America and records for Chanel Classics. She is also founding member of Ricordo , whose first CD of music by Biber for Linn Records has recently been released to great critical acclaim. Kati is teaching regularly at the annual Jerusalem Early Music Workshop, and is on the faculty of Birmingham University. Born in London, Sebastian Comberti studied in Italy with Amedeo Baldovino and later with Derek Simpson and Sidney Griller at the Royal Academy of Music, from where he graduated in 1977. In 1976 he became a founder member of the Bochmann Quartet giving concerts throughout the British Isles and in Europe. In 1983 he was appointed principal cello with the London Mozart Players, since when he has appeared on numerous occasions as soloist, as well as being an active member of the LMP Chamber Ensemble. As a member of several chamber groups he has recorded for CPO, CRD, EMI, Harmonia Mundi, Hyperion, Meridian, Phoenix and RCA. A keen interest in historically informed performance has resulted in participation with a great many of London's period instrument groups, frequently appearing as principal cello with the Orchestra of the Age of Enlightenment and soloist with the Hanover Band. Research into early cello repertoire has led to several recitals being recorded by the BBC. In April 2001 Sebastian Comberti founded Cello Classics, a label devoted to recordings of rare repertoire and artists, for which he has released CDs of hitherto unknown sonatas by Boccherini, works for cello and harp, quartets for 4 cellos, and with Maggie Cole, early 19th Century sonatas with fortepiano. Maggie is one of the key musicians in the Sarasa Chamber Ensemble based in Cambridge, Mass. USA. With them she performs a wide range of repertoire on harpsichord, fortepiano and modern piano. Programmes have included over the past few years, Bach harpsichord concerti and cantatas, 17th century instrumental and vocal music, Haydn and Schubert trios, and works by Ravel, Martinu and Pärt. Sarasa's guiding mission is to enrich the lives of the broadest possible community, especially those who do not have easy access to live chamber music. Every public concert is linked with an outreach concert in facilities such as homeless shelters, prisons, hospitals, and mental health centers. Sarasa has received critical acclaim for its musical interpretations and is hailed for its "great clarity" and "irresistible energy". Drawing on a pool of more than forty world-class musicians from the United States, Europe, and Canada, the ensemble varies according to the particular program of each of its concerts. 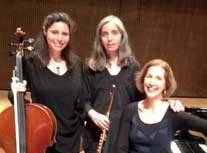 The non-profit ensemble has toured throughout New England and in Cuba, Ireland, and India, and produces The Sarasa Chamber Music Series (in Cambridge and Concord, Massachusetts). With individual backgrounds in period instrument performance combined with a shared appreciation of "modern" instrument timbres, the three musicians of TRIO NOGA bring to their audience uniquely personal and sensitive interpretations of repertoire ranging from the late 18th century to the early 21st century. Idit plays and performs on various flutes, from early instruments of the Baroque and Classical eras to the modern flute. A special part of her musical activity is devoted to contemporary music for flute. She has performed and recorded many pieces composed especially for her. Idit has performed extensively in Israel, Europe and America as a soloist and in chamber ensembles. She is a prominent flute and traverso teacher much appreciated by the many students who receive her insightful and committed teaching. Orit is the principal cellist of The Jerusalem Baroque Orchestra (under conductor, David Shemer). As a modern cellist, she has performed contemporary music and participated in musical projects drawing from theatre, dance, and recorded soundtracks. Maggie enjoys an international musical life playing and recording on harpsichord, fortepiano and modern piano. Best known for harpsichord recitals with repertoire spanning the 17th to 21st centuries, she is also fascinated by the Classical period and explores this with her fortepiano-based Trio Goya (Kati Debretzeni, violin and Sebastian Comberti, cello).